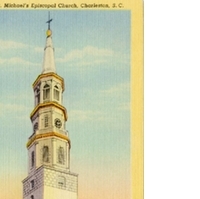 A postcard depicting St. Michael's Episcopal Church in Charleston, South Carolina. The church opened in 1761, but was built on the site of the first Anglican Church built south of Virginia, making it the oldest church edifice in the City of Charleston. "History." St. Michael's Church. http://www.stmichaelschurch.net/about-us/history/. “St. Michael's Episcopal Church Postcard.” RICHES of Central Florida accessed April 24, 2019, https://richesmi.cah.ucf.edu/omeka/items/show/6755.